We’ve published several articles about HP during the past year. Here are some the ones that received the most number of visits. A collection of articles highlighting HP's activity over the last year. HP Inc. is giving its bare-bones, cloud-based laptop a few upgrades. The company’s next Chromebook, the 11 G5, will include an optional touchscreen when released in the fall – all the better to support the touch-based Android apps that Google Inc.’s Chrome OS is expected to support before the end of the year. In a June 27 press release, HP also promised that the 11.6-inch, 2.51-pound 11 G5 will run for up to 11 hours on a touchscreen-enabled device, and for up to 12.5 hours on a non-touchscreen device, both of which will be powered by an Intel Celeron N3060 processor. Like its predecessor, the higher-end Chromebook 13, which was released in April, the 11 G5 is specifically being aimed at the enterprise and education markets, with HP emphasizing the budget-priced line’s usefulness and affordability for students and teachers, which it says will only grow when Android apps are added. HP also noted that the 11 G5 will be arriving during a time when Chromebooks now represent a larger percentage of U.S. quarterly market sales than Apple Inc.’s Mac computers: according to International Data Corporation (IDC) research, around 1.76 million Macs shipped in the U.S. during the first quarter of 2016, while nearly 2 million Chromebooks were sold during the same period. The Chromebook 11 G5 is expected to be available through HP’s channel partners starting in July and at retailers in October. 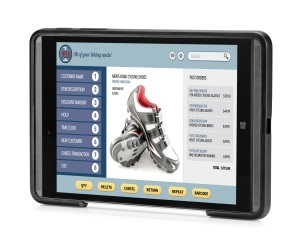 U.S. pricing starts at $189 USD for the non-touchscreen model. As of this writing, Canadian prices have not been released. A device that will see if there’s any mobile ground left for Microsoft to stake its claim will start shipping in Canada by the end of the summer. 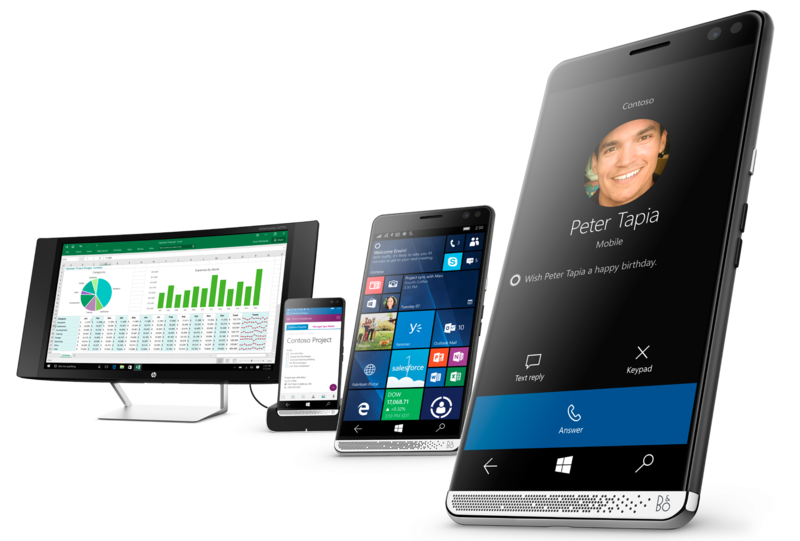 HP Inc.’s “three-in-one” device, the Elite x3, will begin its global rollout at the end of July and go on sale in Canada Aug. 28, according to the vendor. As seen in its debut at Mobile World Congress, the device is the size of a large smartphone or “phablet” and transforms into larger form factors with different docks. As a makeshift desktop, the smartphone won’t run the full desktop apps that a typical Windows 10 machine would, but it will run all the apps available in the Windows Store and support connectivity to larger-format displays, thanks to Windows 10’s Continuum feature. When using this feature, many apps – like Outlook – appear in a layout similar to their full desktop versions. A desk deck allows the phone to be connected with any monitor supporting DisplayPort input. Finally, a lap dock provides a 12.5-inch laptop style display via a wireless connection with the phablet. HP’s goal for the device is ambitious: It suggests that rather than using multiple devices throughout the day to get work done, workers could rely on just one device for all their needs. HP’s president and CEO Dion Weisler describes the company’s vision in a YouTube video. So far only American pricing is available for the device and its accessories. The Elite x3 base price starts at $699 USD. A bundle that includes the desk dock, a premium headset, and a lap dock will start at $799 USD. Sold separately, the desk dock is $129 USD. Microsoft’s claim to the mobile landscape has been marginal since the days of Windows Mobile. An attempt to fire up a mobile hardware division by acquiring Nokia hasn’t gone well, with Microsoft announcing a $950 million USD writedown and layoffs of 1,850 in May. HP’s strategy is all about going after B2B buyers, as the Elite x3 won’t even be available in retail stores. Instead, HP will be counting on its direct sales and partner channels to push out the device. HP is also working to provide app virtualization to the device, which will be important to businesses using legacy apps that wouldn’t otherwise be able to run on Windows 10 mobile. HP Inc. customers that want the newest shiny laptop or tablet no longer have to go out and buy it, or even bother managing it, as the vendor is introducing a new Device as a Service offering. Generally available on Thursday about a year after HP announced it was trying a pilot program in the Asia-Pacific region, it’s billed as a complete device lifecycle management service that offers its customers flexibility. On a single bill, customers can count on HP to procure required devices, deploy them, and support them. IT administrators get a web-accessed dashboard that tracks the location, health, and performance of devices deployed on the service, and a smart analytics feature is used to anticipate when hardware will need service before it breaks down. Device as a Service was inspired after HP has found a lot of success with its Managed Print Service, says Bill Avey, general manager and global head of PS services at HP. And it was demand from customers that brought HP down the road leading to this service, with some specific customers already arranging contracts on an ad-hoc basis. For example, Siemens Brazil is already using HP for a full-blown outsourcing solution for its hardware. Coffee Bean & Tea Leaf is a cafe chain that’s outfitting its restaurants with an electronic cash register supplied and managed by HP. In total, there’s customers in 20 countries around the world already doing this, Avey says. The service, management, and support aspect of the new service need not come attached to the device subscriptions either. HP says if a customer wants to buy their hardware and then pay for the management service portion on a monthly basis, that’s no problem. The service is also in response to IT managers struggling to keep tabs on their hardware ecosystem, Avey says. Many admins don’t know what devices are in their ecosystem, or if they’re meeting the needs of their users. So with this service, they get complete analytics about an entire fleet on a single dashboard (it’s mobile friendly too). “IT gets a very clear cost structure from this,” he says. The analytics can also detect PC health problems, potentially before a user notices anything amiss. For example, the service will detect when battery life is becoming shorter and mail the PC user a new battery before they’re required to stay tethered to an outlet. Channel partners of HP will also be able to offer Device as a Service, Avey says. “We’re choosing to do the hard work of working with partners from day one. “We’re working with our channel partners to define exactly what our programs will look like,” he says. But partners that do sign on can expect that they’ll have access to a single management portal with all their customer information. Because the service is so variable based on customer requirements, HP didn’t offer any pricing for the new service, beyond saying it was on a per-user, per-month basis. Avey says the service is best-suited to a firm with at least 300 devices. Less than that, and businesses should be looking to HP Subscription instead. The growing power of the online consumer seems to be a recurring theme in the retail industry this week, with HP Inc. unveiling a series of products on Jan. 17 that when combined will give retailers the ability to safely process their customers’ personal data while allowing them to pay from wherever they happen to be standing. With HP’s Pro Tablet 608, Pro Tablet Mobile Payment Solution, and Pro Tablet Mobile Retail Solution, retailers will have an easier time incorporating mobile technology such as credit card chips and NFC-based apps such as Google Wallet and Apple Pay into their customers’ shopping trips, while the RP9 Retail System utilizes data protection technology from Intel to mitigate security risks without compromising speed. The company’s goal, McElroy said, is to help “level the playing field” between a retailer’s customers and sales associates, by empowering the latter to help the former in whatever way they need, whether it’s by providing information, comparing in-store prices with those listed online, or helping complete a sale – all with the high level of security that tech-savvy consumers demand. “Without a secure solution, everything else you do is pretty irrelevant,” McElroy said. The Windows 10-based RP9 (top image) features a 15.6-inch or 18.5-inch touchscreen display, a compact M.2 SSD and M.2 Wireless LAN with an optional Bluetooth component, and is powered by sixth-generation Intel Core processors. 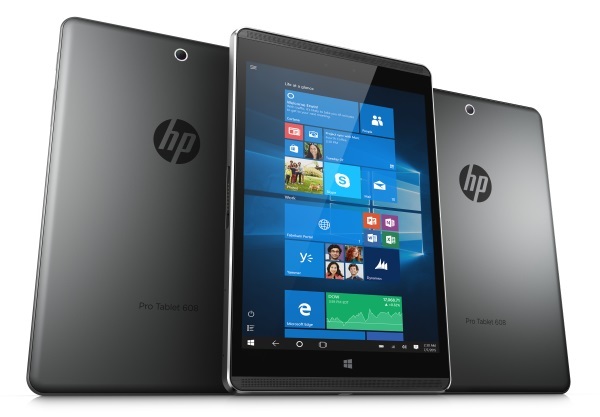 With the mobile devices, HP is emphasizing adaptability: the Windows 10-based Pro Tablet 608 (below) features an eight-inch HD screen, quad-core Intel Atom processor, and up to 4 GB of memory and 128 GB of storage in an 8.35 mm package that weighs less than one pound. 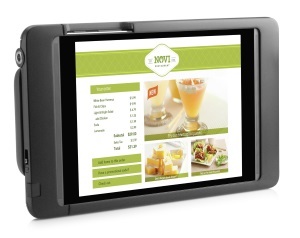 The 608 fits snugly inside both the Pro Tablet Mobile Payment Solution (bottom-left), which is compatible with Verifone payment devices, and the multi-vendor payment terminal-based Pro Tablet Mobile Retail Solution (bottom-right). It’s been almost five years since HP Inc. abandoned Palm and webOS; and its last smartphone, the HP VoiceTab, was launched two years ago – in India. But now HP is re-entering the North American smartphone market in a big way – the company officially announced the release of the Windows 10-powered HP Elite x3 today, one day before the Mobile World Congress begins in Barcelona on Feb. 22. The release of the x3, a 5.9-inch smartphone that HP says can serve as a stand-in for users’ desktop, notebook, and tablet computers thanks to a series of docks it plans to bundle with the device, marks not only the company’s first entry into the mobile enterprise market, but the first time a third party has collaborated with Microsoft Corp. to offer a Windows 10 smartphone. In addition to its sizeable 2560-by-1440-pixel screen, the Elite x3 boasts a Qualcomm Snapdragon 800-series processor (with users having the option of installing two dual-core 2.15 GHz Snapdragon 820s), 64 GB of storage, a microSD port that can be used to add up to 2 TB of additional storage, a 16 MP rear-facing camera, an eight MP front-facing camera, a dual-biometrics device with both eye-recognition and fingerprint-reading capabilities, and 4 GB of RAM. It’s also waterproof, and while Nuttall could not offer specific numbers regarding battery life, he boasted that the x3’s battery was 15 per cent larger than comparable devices, and designed to run for a full business day, with all of the “rigours of the workplace” that entails. 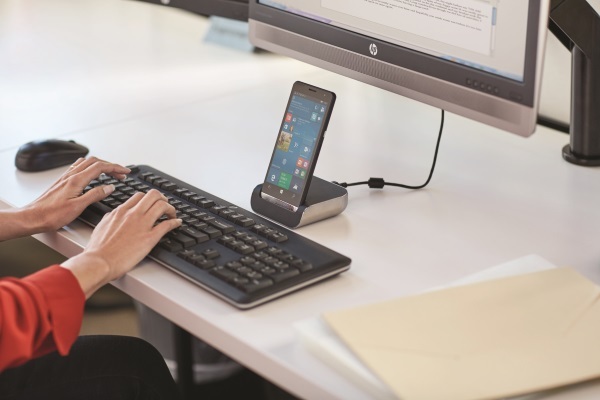 Like Microsoft’s Lumia line of Windows smartphones, the Elite x3 can also be plugged into a monitor using Continuum, a feature that HP plans to make central to its marketing, supporting the device with a series of docks that will be available at release (below), both separately and as a bundle, turning it into a viable notebook or desktop. When asked how the x3 will differ from previous attempts to create a single mobile, laptop, and desktop device to little success, Nuttall said that previous devices were underpowered, and released to a market that wasn’t prepared for them five years ago. The x3’s development was inspired by feedback from HP’s enterprise customers, whom Nuttall said demanded the larger screen and frequently complained about the need to switch between two or three computing devices for work. More than half of the customers who have tested the device said they could see it replacing a tablet, while more than a third said it could replace their notebook, he said. Though aimed at the enterprise market, the x3 will also be available for consumers at HP.com. HP declined to reveal the cost of the x3 or its accessories, nor has it given a firm release date, though Nuttall said the company expects to ship the device in August, will announce the device’s initial markets before then, and that buying the bundle, including notebook and desktop docks, would be a cheaper proposition than purchasing a desktop, notebook, and phone. 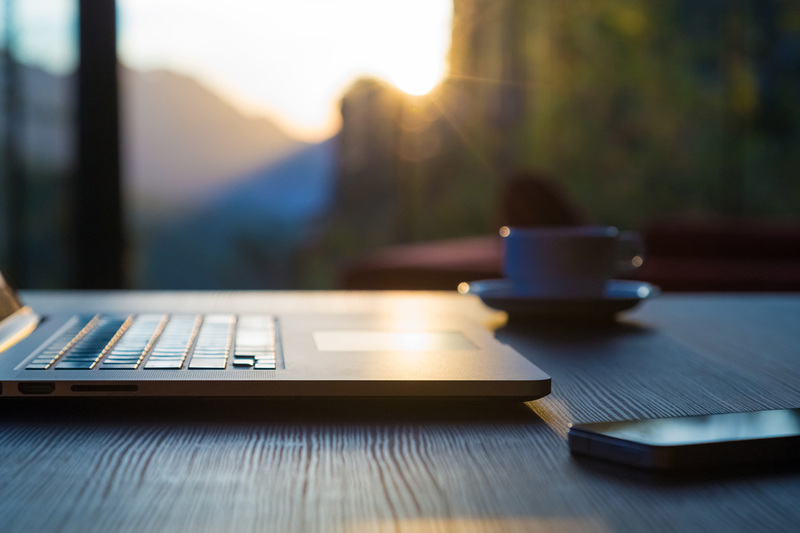 Between shrinking office space and an ever-increasing number of monitors, business PC users have less desk to work with than ever before, and HP would like to help. Today the company unveiled the HP Z2 Mini, a server-grade workstation shorter than an espresso cup and only slightly wider than a monitor’s base. In a Nov. 15 statement Jeff Wood, vice president and general manager of HP’s Workstations and Thin Clients division, called the mini workstation “the ultimate combination of space efficiency, elegance, and power,” adding that he expected the Z2 to disrupt office workstations, much as he said the HP Z series had “redefined” the category in 2009. According to the company’s research, the average American worker’s space has been reduced by 60 per cent over the past 10 years, and 38 per cent of users now have two or more displays. Measuring 8.5 inches wide and 2.3 inches high, the Z2 Mini is 90 per cent smaller than the average enterprise-class workstation. It’s also been designed with power users in mind, with HP emphasizing its value for workers in the computer-aided design (CAD) industry and claiming it’s twice as powerful as any commercial mini PC on the market today. “The HP Z2 Mini was designed for the millions of CAD users demanding smaller hardware without compromising acoustics and performance and mission-critical reliability,” the company said in its release. Among other features, the Z2 Mini includes Intel Xeon processors, an Nvidia Quadro M620 graphics card, an optional 1.5 TB HP Z Turbo Drive, custom-designed-fan-based cooling system that HP says is 63 per cent quieter than its business-class mini PCs, and support for both Windows and Linux operating systems. It’s also designed to be easily placed in multiple positions: on or under a desk, mounted behind an HP Z display, or on a wall. HP plans to release the Z2 Mini worldwide in December, for a starting price of $945. HP Labs head Shane Wall believes the next 30 years will bring about technological change most of us can only dream about. PALO ALTO, Calif. – Whenever Shane Wall is asked what he believes the next big thing in tech will be – and as HP Inc.’s CTO and global head of HP Labs, he’s asked that question a lot – his answer throws people off. “What we do at HP Labs doesn’t start with technology,” Wall told the crowd during his Sept. 27 speech introducing HP Reinvention Week, the company’s celebration of HP Labs’ 50th anniversary. Accelerated innovation, as what Wall called “glass slabs” make way to wearable and, eventually, implanted technology capable of bringing us online. Twenty-five years ago, in 1991, the world had only 10 megacities – defined as 10 million people or more – Wall said. By 2030 there will be 41 megacities, and by 2046 we’ll have more than 50. What’s more, the majority of those megacities will be located outside the mature markets of Australia, North America, and western Europe – in fact, the majority will be in China and India, and some will even be in Africa. For example, one issue facing humanity that Wall said HP Labs is currently studying is 3D transformation: although we live in a 3D world, much of our work environment is currently in 2D – experienced on monitors, smartphones, and tablets. As technology becomes more adept at scanning, manipulating, and producing physical objects, however the result will be another industrial revolution – led by what Wall called “digital manufacturing” – with cities capable of using 3D printing to manufacture whatever is needed, wherever it is needed, rather than relying on a physical supply chain. Today’s marketers love to focus on millennials – that vast, much-reviled generation born roughly between 1982 and 1998. But in 30 years, the largest demographic will be people over 50, and their expectations will shape future technological change. Moreover, the generation that will be decried as the 2040s’ answer to millennials will have grown up with technology even more advanced than smartphones in their hands, Wall said, and 97 per cent will have been born outside the U.S. and western Europe. “It will profoundly influence how they look at the world around them,” he said. Another topic of interest to HP Labs is microfluidics – the transformation of industries with new technology – and by 2046 Wall expects technology will have had a profound impact on many sectors, particularly the healthcare industry. “You can move from a world where systems are centralized – where doing tests are very expensive and slow – into a world of global diagnostics, where things happen very cheaply and the power is put into the hands of the individual,” he said. It’s Wall who made the Donald Trump joke, not us. The Internet has created a world where many of us now expect things to happen instantly, often across international borders, at the speed of light, Wall said – and by 2025, well before the 30-years-from-now mark, half of the Fortune 500 is expected to be located outside the U.S. So with technology developing at such high speed, and with such an international scope, new ideas and products will be developed exponentially faster until they’re being executed and released at a speed we can’t imagine, Wall said. Another subject of great interest to HP Labs is the “Internet of all things” – hardly a surprise, since as a printer manufacturer HP has one of the industry’s largest IoT networks. But imagine tables being connected to the Internet. Chairs. Bills. Plastic. Every one of them capable of being uniquely tagged, identified, and associated with an Internet service. Hypermobility, meanwhile, is HP’s vision for what connecting to the Internet will look like once we move on from the “glass slabs” that, on average, we stare at 137 times a day to attachments on our bodies. HP’s global head of 3D materials and advanced applications, Tim Weber, shows off a component of the HP Jet Fusion 3D 3200… that was printed by the HP Jet Fusion 3D 3200. PALO ALTO, Calif. – Its name might be synonymous with ink-based printing technology, but hardware manufacturer HP Inc. has deliberately avoided entering the third dimension – until now. During HP Reinvention Week, its celebration of HP Labs’ 50th anniversary, HP revealed the Jet Fusion 3D 3200, a new flagship product aimed at the consumer, aviation, automobile, healthcare, and industrial manufacturing sectors that the company will officially release in November. Unlike its signature InkJet technology, however, HP will be focusing solely on the Jet Fusion’s hardware, while leaving materials to the experts. Instead, HP has carefully chosen four key partners that Weber says can demonstrate both the variety of materials the Jet Fusion is capable of processing, and the range of applications it can support: Ohio-based hydraulic manufacturer BSF Inc.; German specialty compound manufacturer Lehmann & Voss & Co.; and European chemical manufacturers Evonik Industries and Arkema. Within a year, HP plans to collaborate with additional partners, adding any materials they develop to an online directory that manufacturers will be able to browse for themselves. If that sounds a lot like the App Store, it should – Weber openly admits that HP is using Apple Inc. as a role model. And similar to the Cupertino, Calif. tech giant’s payment policy with app developers, HP intends to charge certified third parties a nominal fee for every Fusion-manufactured product or Fusion-compatible material sold, he says. At its core, the Jet Fusion utilizes what Weber calls multijet fusion technology with a powder bed, similar to other 3D printing hardware on the market. However, it also utilizes the company’s InkJet technology to build up to 10 versions of the same component at once, giving HP the edge it needed over its competitors to successfully enter the race to deliver what he calls “the next industrial revolution” – enterprise-scale manufacturing on demand. Another reason the product is finally ready to be released is it makes financial sense for short-term manufacturing – a fact HP knows firsthand, since the printers manufacture their own parts. “It’s cheaper to produce a number of these than to build a very complicated $100,000 mold,” Weber says, holding up one of the Fusion’s 3D-printed components.